We stock our weekend markets with the best seafood North Carolina has to offer. Walk-ups are welcome and our sales team will be happy to assist you in selecting your fish or shellfish. Many items sell out so we encourage our customers to reserve their weekend purchase ahead of time. If you would like to reserve your catch based on our current market availability, please fill out the form below. We will pack your reservation for pickup at the selected market and time. We are not accepting reservations for our market at Transfer Co. Food Hall at this time. Our pre-orders have closed for the weekend. Our market will be stocked with plenty of great seafood. We hope to see you there. Supply your next party, wedding, or large event with fresh North Carolina seafood. We can facilitate most requests up to 1 week in advance, but if you are looking for a specific product, we encourage you to order as far in advance as possible. Please email us at orders@localsseafood.com to submit your pre-order. We will follow up and let you know if we can fulfill your request and provide a price quote. We ship seafood to consumers, retailers, and restaurants across the United States. 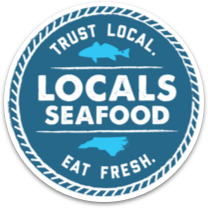 To inquire about shipping Locals Seafood, drop us a line at orders@localsseafood.com including your order request and shipping address.